In the immediate aftermath of the Charlottesville terror attack, the far-right website GotNews posted what seemed like a huge scoop. The website said it could "exclusively reveal" that the person who had run over a group of demonstrators in a Dodge Charger was not a white nationalist, but instead a critic of President Donald Trump. The Michigan man GotNews had identified was in fact not the driver. He was not even in Virginia at the time. But within hours he and his family had been forced to flee their home at the advice of local police, who expressed concern for their safety after a slew of death threats rolled in. The family's flight from their home capped off a feverish attempt by right-wing sleuths to discover the culprit behind the Charlottesville attack and dig into his or her history, seemingly in hopes of proving the person was not of a right-wing political persuasion. To be sure, GotNews wasn't the first outlet to peddle the false report. There had been similar chatter online on places like 4Chan and Twitter, and other far-right publications also ran with the false story. But GotNews wrote about the man who was wrongly identified, Joel Vangheluwe, and his family, in perhaps the most confident terms of any publication. It retracted that story not long after it was published. "You want to talk about fake news -- dear lord, some of these folks," Andrew Sommerman, an attorney for the Vangheluwe family, told CNNMoney in an interview this week. Sommerman added that the family intends to pursue legal action against the online publications that peddled the misinformation. The sleuthing performed by these activists was not very complex. Images from the scene of the deadly attack had captured the vehicle and its license plate number. GotNews said in its story, which carried no byline, that it then ran a license plate search which returned a registration result for Jerome Vangheluwe. "A Facebook crawl of his relatives reveals the car was in the possession of his son, Joel," the GotNews story said, seemingly in reference to one 2011 post in which Joel had taken a photo of the vehicle and said it would be his when he turned 16. But GotNews and the other sleuths and publications were wrong. The car was not "in the possession" of Joel. The vehicle did once belong to his father, Jerome, but the family had sold it years ago. 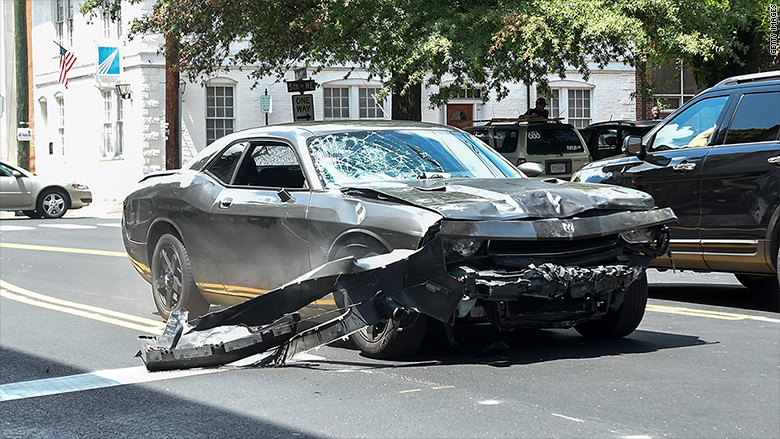 Moreover, police later identified the driver as James Alex Fields Jr., a 20-year-old who held extremist white nationalist views. Yet, as typically happens, before the facts could catch up in the aftermath of the attack, misinformation ran rampant. Before and after GotNews published its story, people on the right passed around the rumor that Vangheluwe was the driver, declaring the attacker to be a person with a liberal worldview. And an excited Internet mob rummaged through Vangheluwe's Facebook page, sharing his anti-Trump posts. As all this was going on, Sommerman told CNNMoney, Vangheluwe was at a gathering to "say goodbye" to a relative "not doing so well." While at that gathering, he was inundated with messages on social media. He eventually took to Facebook to respond. "I'm not the one, i'm from f**king michigan you idiots," he wrote in one Facebook post. In another, Vangheluwe added, "I drive a 2009 chevy impala, not a challenger, f**k the internet." It was seemingly too late. Sommerman told CNN the misinformation ricocheting around the internet had prompted a stream of threats directed at Vangheluwe and his family. "It's been really bad. They've been terribly harassed," Sommerman said. "The family has been devastated." Sommerman said the family received so many threats that the authorities became involved and that the family eventually left their home at the suggestion of police. Lt. Mike Shaw, a spokesperson for the Michigan State Police, confirmed to CNN that authorities advised the family to temporarily stay elsewhere. Shaw also said police increased patrols in the area. Now the family plans to take legal action. Sommerman wouldn't provide a list of outlets the family could file suit against, and stressed it would take some time to prepare the complaints, but said he was taking a close look at the websites which ran with the inaccurate report. "There are consequences to fake news," Sommerman told CNN. "There are consequences to false reporting." "My message to those outlets is that if your words can cause great harm, and has caused great harm, you must suffer the consequences of the law as a result," he added. "And the law does not tolerate this type of behavior."